Are you the owner or manager of a business looking for a way of treating your staff or clients? Then why not book one (or more) of our Ice Cream vans to attend your factory, offices or site? 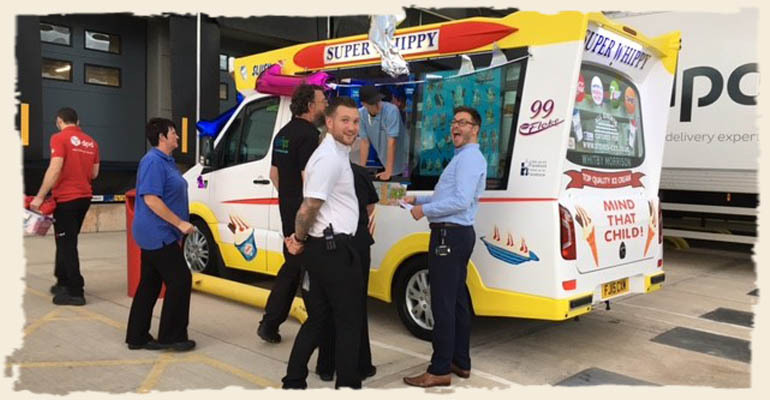 Whether it’s a team building exercise, company fun day, leaving party or a simple treat, show your employees your appreciation by treating them to a fresh, award-winning soft ice cream from Steve&apos;s Ices. This can be a great way of showing recognition for your staff and does wonders for morale. We provide a choice of regular ice cream or a selection of ice creams, ice lollies and soft drinks. We have a minimum order value depending on location and time. Over the years we have attended many different shows and events with our ice cream vans, from fetes with a few hundred people to 3 day festivals with 100,000 people. With less ice cream vans trading on the streets these days, an ice cream van providing fresh ice cream and refreshments is always popular at any event. We can supply one van or several, modern or classic.